I have an unrelated permissions comment. Now, people who are not logged can see the avatars (if they know the URL). Maybe that’s okay, but i just noticed it and thought i’d mention it. Hi, I would like to learn more about the permission system. How can I change permission default? How can I customize the permission system? How can I create ROLES that apply to different members in a group? How does the system resolve conflicts of applied ROLES? Are there role hierarchies and how can I control them? Is there a possibility to add a custom backend to control permissions (Database / File /LDAP)? I tried to understand the code, but I do not know too much about Rails – I see that there are several RBAC Rails Plugins out there, but crabgrass seems to implement their own stuff. However, it would be very interesting to read a verbose description about the permission system! How do you think about implementing a more generic way of groups / permissions? Ruby world has a few implementations to offer, i think it would be good, not to walk alone in this area! Just a hypothetical, but say someone is causing trouble and needs to be voted out of the group. How does that work? how i can delete somebody from the group ? We had the idea with my group to backup our working page, so that we don’t lose it in any case of server crash (this doesn’t mean we don’t trust crabgrass, but we do not want to lose this job! ), and moreover, in order to be able to have a look on our work locally. I’m sure i made no mistake in the working group’s name, so i don’t understand why the url could not be solved finally. Would you help me making this backup, even with another command line ? The user, password mechanism you are trying is different from the one crabgrass uses. We currently only support cookie based session authentication. Here’s a starting point for wget. I have not tested this myself yet though. If it does not work please check if the cookies.txt file contains any cookies. If you can download the landing page of the group you can also download other pages. You might want to use the print view – at least for the wiki pages. Thank you for your advice. I could connect and download part of our pages, even if unfortunately something seems to be bugging — seems to come from my os, the download made it bug twice during the operation. I’m using Tails, and I would bet something leads to a RAM overflow : after some minutes, my fan panics and all operation are frozen ; having a look at the memory status before the freeze, I could see the part of used Mem increesing more and more… Maybe I should look for some realtime syncronization options during the backup (I save the files on my USB stick, to avoid saving it on Tails’ desktop that could be quickly filled, which I supposed to be happening during my first try, and I’m now really sure this stick is large enough to save those 20 or 30 Mos I try to backup). Actually you can see I’m not familiar with wget. I may perform other tries, and write another comment to share if I find some tiny options that allow me to download everything without a bug. For now I could perform an essential and not-so-easy-to-restore backup, which is better than nothing. gdmz, glad it helped. Thanks for the details. Frozen os might be a heat issue with a broken fan or so aswell. If you have > 1Gb of ram that should not be a problem. Otherwise you can use sync to tell your computer to write all cached data to the usb stick. This should work in parallel to the download. Just type it in a different console. Oh… and for wiki pages i just braught back the group/page/print url. You can use that if you want to avoid the menus and include all the comments. Print view for other page types will still take some time though. How do we approve a pending request for the creation of a council? alva, this question has come up quite a few times lately. We obviously need to make the UI and maybe even the process more clear. The person approving the request has to be a member of the group for at least 2 weeks i believe. The idea behind this is that we want to prevent group ‘takeover’ by generating a council. That is already done by requiring someone else to approve the request. But one could still just create a new account, invite that fake account to the group and use it to approve the request. So instead we decided to require a certain time of group membership until you can approve council requests. how do I delete a group member that accidentally approved? if I go via members and click “delete member” all I seem to be able to do is delete this pending command instead of approving it. can anyone help? I think it takes two people to remove another person from the group. So someone else has to approve the request. You yourself can only delete the request ( ~ take it back). Removing people from groups can be very destructive so we try to make sure at least two people are involved in the decision. Naya, I send you a private message so we can investigate this. It sounds like a bug. hi, my group recently changed our name, then we changed it back, and now we cannot access some of the older pages… please help! Hey, here i corrected the german version of this side. Thanks for the update. I had not even intended this change when updating the page list on the dashboard. I was focussing on a different issue. I’m confused about what a member of a network council has permission to do, when the network has both multiple groups (each with their own council) and each group has multiple committees. Can anyone provide any insight? Also, who has permission to add/remove people from a committee? Those in the committee’s group’s council only? The text above only refers to adding/removing from the group. members of a network do not have more access to the networks groups than they would have without the network. members of a group have access to a network the group is a member of. If there is no council in the network all members of the network and all members of the groups of the network can admin the network. 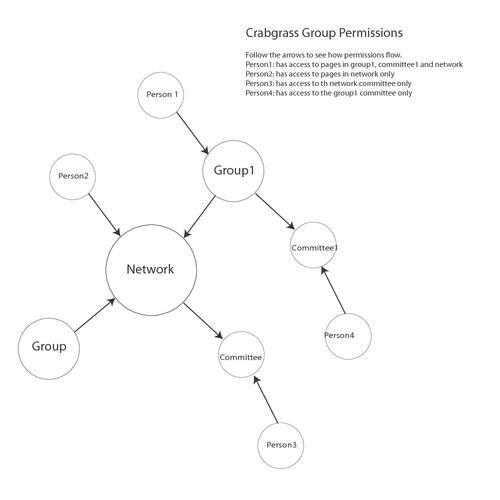 new permissions on the networks groups. Not sure if that helps. So basically groups are the main layer of access permissions. if you are in a group you can also access the committees of the group and the networks of the group. If you are in the network or the committee only you cannot access the group. Networks are meant to share information between autonomous groups. Committees are meant to substructure the groups and invite outsiders into these working groups without granting them access to the rest of the group. abbe, does that help to clearify things? Thanks, azul. This helps clarify the network council a lot. Just my final question remains – about ‘control’ of membership in committees. If the groups are supposed to be the main layers of access permissions (helpful to think of them that way), then I’m confused why I seem to be able to remove people from / send invites to committees when not on the group’s council. I thought it was because I was on a network council, but clearly that’s not the case. Can anyone in a committee add/remove people or is it just the people who in the group as well? How do I delete a group? I just created my wiki and started setting up groups but really don’t know what I’m doing. There’s no option to delete the group (an Organization) in any of the group’s tabs. I was trying to open a bug via the link on the button but the issue tracker is read-only. So anyway, in a Network we are forming we have the issue that individual members can be removed, but there is no way to remove a group. This would be vital once groups in the network become defunct though. Please anyone with appropriate permissions create a bug or indicate if you would accept a pull request fixing the issue. je n’arrive plus à créer de commission pour le groupe que j’ai crée. les autres membres non plus. et le conseil est signalé inexistant. Comment faire pour résoudre ce souci?